Over the course of the first four episodes, we’ve watched Arthur gradually grow more confident, and less afraid. That being said, not much could prepare him for the end of the previous episode, where, in order to escape Miss Lint’s grasp, he flew away in a suit that he still has no idea how to operate. Arthur spends much of the first half of the aptly-titled “Fear Of Flying” trying to figure out how to navigate the suit, and it leads to some of the most cathartic moments of the series so far. Tick and Dot are basically polar opposite voices in Arthur’s life; whereas Tick is constantly telling him to follow destiny and become a superhero, Dot worries for him, and wants his life to be as safe as possible. It was natural that there would eventually be a clash between the two, and we finally get it here, as they both attempt to talk Arthur down from his flight. Dot wants to call the fire department, while Tick insists that Arthur can figure a way down himself. 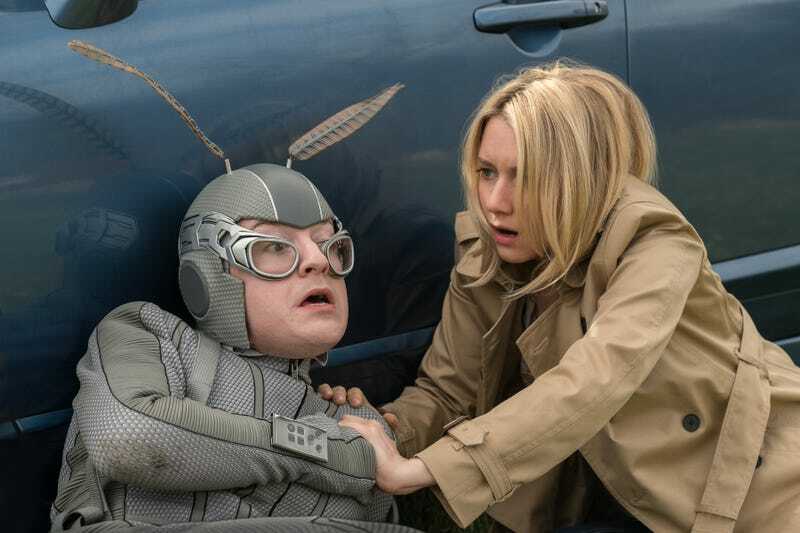 In real life, Dot’s rationality would be the right course of action, but in this case, Tick’s instincts are correct, as Arthur figures out how to navigate the suit. The tension between Dot and Tick as they track Arthur down works quite well, as we can see where they’re both coming from, and that they both want what’s best for Arthur. The series has done a good job of not turning Dot into a villain. It would be easy to just make her a wet blanket, but the show makes it clear that her concerns are well-founded, even if Arthur isn’t quite as helpless as she thinks. Unfortunately, just as Arthur is about to safely land, he’s accosted by Overkill, who was able to track the suit down. Overkill also believes The Terror is still alive, but believes he should take him down himself, and wishes Tick and Arthur would stay out of it. In an amusing moment, a fight between Tick and Overkill is ruined when Arthur and Dot’s reunion steals their thunder. Just as this is happening, Ramses shows up with his thugs from the Pyramid Gang leading to a showdown where Overkill kills several of them, and Tick takes Ramses out by throwing a tire. He condemns Overkill’s murderous ways (“for the record, I do not approve of his methods!”), but it’s not enough to stop the pair from teaming up to take down The Terror. The episode’s most difficult moment comes when Arthur ultimately decides to join them, much to the chagrin of Dot. She no longer thinks he’s crazy, but nonetheless wants him to leave the situation before anything bad can happen to him. Of course, we know what choice he’s going to make, and everything up to this point would lead us to believe it’s the right one, but it’s hard not to empathize with Dot here. She’s spent her life looking after Arthur, and now he’s putting himself in another dangerous situation. When Tick mentions to Arthur that he’s upset, he doesn’t want to talk about it. One imagines the pair will reconcile before too long, but knowing how much they both care for each other, it was tough to see them depart on that note. This was the most rewarding episode yet, featuring some great action sequences, plenty of one-liners, the great sequence of Arthur figuring out how to fly the suit, and the most emotional moment of the series so far, when he and Dot reunite (even if their reunion is broken up by Arthur’s decision to keep up his hunt for The Terror). 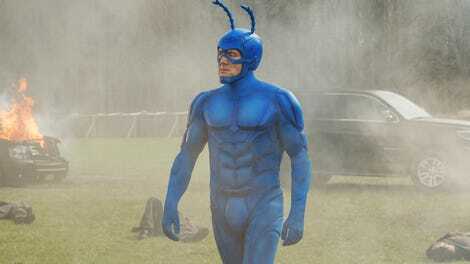 With one episode to go, The Tick has brilliantly set us up with several questions, and given the viewer all the reason in the world to want to know what the answers might be. The serial format has fit The Tick nicely, as this iteration has proven to be quite engrossing. As great as the 2001 Fox series (which had a different villain each episode) was, it doesn’t seem sacrilegious to think this version might surpass it. Serafinowicz makes just as strong a Tick as Warburton did, and watching the story unfold has been nothing short of thrilling. So... we definitely get the payoff with the Very Tall Man in the next episode, right? The dog who write the book from the birthday party in the last episode is Onward, a former member of The Flag Five. He wants us to know that he’s an atheist now, and that Christian Soldier was not his master. “Your mouth says one thing, your guns say some other things...Bald Bad Man! Am I the only one who thinks Overkill’s bickering with the boat’s CPU is a bit like Karen and Plankton on Spongebob?